For a finite-size flow system to persist in time (to live) it must evolve in such a way that it provides easier and easier access to its currents”, meaning that the configuration and function of flow systems change over time in a predictable way that improves function, distributes imperfection, and creates geometries that best arrange high and low resistance areas or volumes. The flood laboratory is a landscape corpse subject to the floods and variations of the Usumacinta river currents. The laboratory is a contemporary art and esculoric gallery in dry season and a flood shelter against flooding in the wet season. The landscape around the building becomes an experimental landscape where alternative crops and activities are explored in a more intense relationship with the river flux. 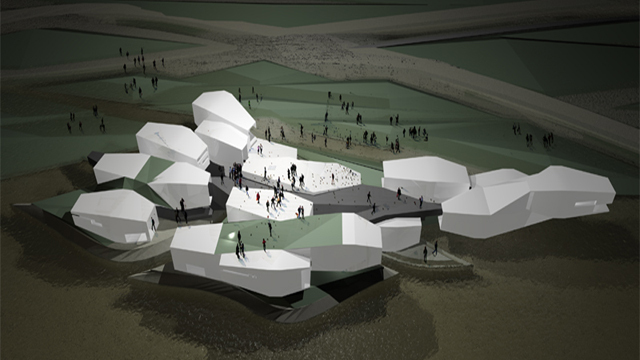 Art installations could become an integral event of the flooded landscape. The laboratory program is transformed into a prototype that within the river currents it is displaced, distributed, eroded, deposited and transformed to adapt to new relationships in the meander. 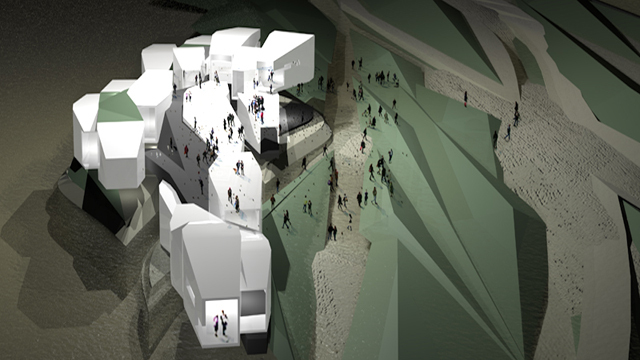 The progression and organisation of the program is constructed around a ramified structure that adapts to the meander geometries creating interstitial circulatory spaces for the internal flow of the museum.